Korea's famous side dish. A meal in Korea isn't a meal without Kimchi! Kimchi (김치) consists of cabbage that has been salted and fermented, over a number of days, in a spicy sauce made up from a large number of ingredients including chilli powder, spring onions, fish sauce and onion. Kimchi is a very popular side dish that has a large number of variations and is also used as an ingredient in a number of other Korean dishes. 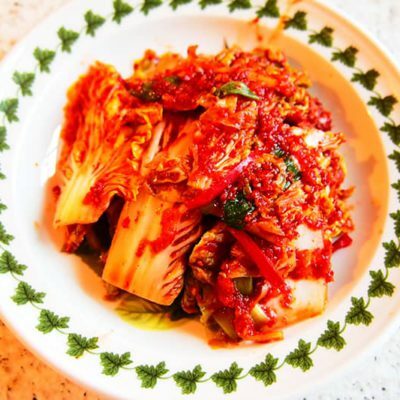 This recipe concentrates on the traditional cabbage version but there are numerous other recipes available for Kimchi using ingredients such as cucumber, white radish and spring onion to name but a few! In the UK the variety of cabbage required for this recipe is called ‘Chinese Leaf’ and can be found in most supermarkets. In the US and other parts of the world this cabbage is known as napa or nappa. 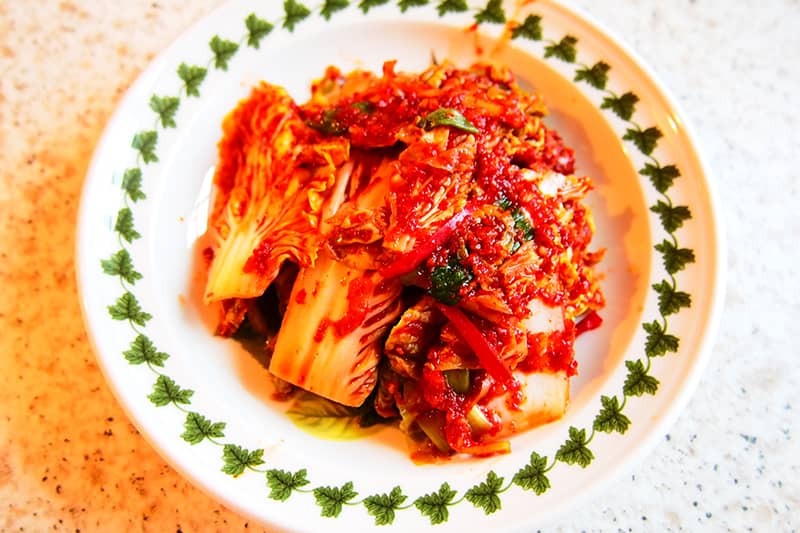 When talking to people in the UK about Korean food it’s quite obvious that Kimchi is widely known and is often quoted by people when asked if they know of any Korean dishes. It’s a kind of love it or hate it food for most non-Koreans. It has a strong flavour and smell that can be off-putting at first but regardless it has many proven health benefits such as aiding digestion, regulating cholesterol levels and has antioxidant properties which means it’s worthwhile giving it a go even if it takes you a while to appreciate its flavour and status in the world of Korean food. Slice the cabbage lengthways in half, then slice each half lengthways again into 2 sections (3 if it's a large cabbage). While you're waiting, mix all of the seasoning ingredients in another large bowl. After 2 hours drain all of the water from the bowl containing the cabbage. Rinse the cabbage pieces with plenty of cold water to remove any undissolved salt crystals. Then squeeze each section of cabbage well to remove as much water as possible. Take each section of cabbage in turn and cover well with seasoning from the second bowl. Make sure seasoning is applied well in between each layer. Transfer each seasoned piece of cabbage into a large airtight container. * I highly recommend using gloves for this step! When all cabbage pieces have been seasoned and transferred to the container pour any excess seasoning on top and close the lid. The Kimchi can be eaten straight away (freshly made Kimchi is amazing!) or it can be left to ferment. If you plan to eat it later it should be left in the container at room temperature for 2 days before transferring it to the fridge.